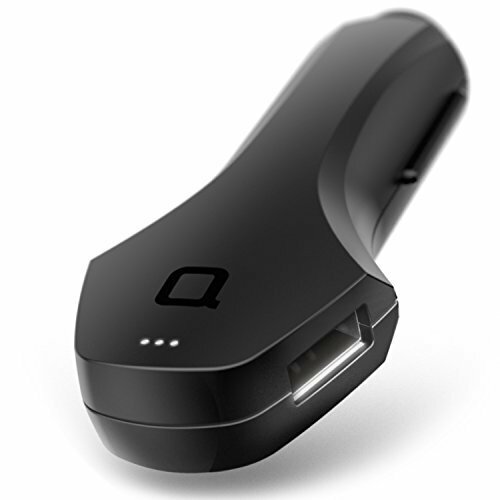 The ZUS Smart Car Locator and USB charger is capable of charging two tablets at once, and can work in conjunction with a small app on your phone that will help ensure that you never lose your car again (after parking somewhere in the see of mall parking and then hitting 26 stores with children in tow). The 4.8amps of total charging capacity mean you can charge two tablets (or phones,) at full blast at 2.4 amps a piece. Of course if your phone or tablet needs a lower amperage it will scale down the port to only charge at that, no risk of frying your devices. The ZUS works in your car’s power outlet (cigarette lighter,) and as a location device works in conjunction with your phone or phones. The ZUS itself contains no GPS or tracker, but the app on your phones when it loses sight of the ZUS (when you turn the car off and the outlets go dead,) kicks in and gets your location and stores it away. You can then set a timer in the ZUS app if you want (useful if you’re at a metered parking space,) and go about your business knowing that your phone knows where your car was parked. As long as nobody moves your car, the ZUS app has plenty of ways to get you from your current location back to your car including a car compass and dropping in the coordinates into an app like Google Maps/Navigation that will provide turn by turn directions to where it thinks your car was. Of course, if someone moves your car you’re out of luck unless they took your phone as well and then handed it back to you after they ditched your car somewhere else. The ZUS Smart Car Locator works via Bluetooth, which means you will need to have that enabled on your phone in order to use the app. The app seems to draw no more power than a passive scan, which tends to indicate to me that at least on Android it’s not much difference than just having BT on and not doing anything. The only real power draws are when you turn off the car and the ZUS app pulls fine GPS coordinates, and then if you’re using the app to find your car as it’ll kick the GPS back on again. The app can work with multiple base units, so if you’re a two family house you can name your ZUS units Honda and Subaru if you want. Multiple phones can talk to each ZUS unit as there’s evidently no pairing involved, just an “I’m here” broadcast that when it’s not there triggers the app. The app needs a little work, but great thing about apps are they can be updated and modified at any time in the future. Other developers can also get in on the game and make their own software. The only changes I want to see with the ZUS Smart Car Locator app is I’d like the ability to enter a note such as “floor 5 parking garage” rather than just a time limit to notify me at. Imagine never having to wonder if you parked in a different parking lot and are actually scouring the aisles carrying two kids and four shopping bags pressing the panic button in a wasted effort on the wrong piece of asphalt. As long as you’ve got your phone with you that can be a reality. Imagine being able to send your car’s location to your significant other who needs to swap out vehicles with you because you’ve got the good car seats installed. They’ve got a button to transmit location. Imagine being able to keep two full sized tablets positively charging while your kids watch movies on the way to grandma’s house. ZUS is available on Amazon Launchpad at the moment, which means nobody in the blog world gets any affiliate money to say the thing’s great and link to Amazon. It appears I may be wrong on that, but you can probably trust the other reviews out there for once. I got my review unit for free, but that’s it, I just like the product and think it can make parenting and parking easier. Not making a dime off of this. This is just a neat device. They also have a four star rating after 718 reviews on Amazon, which considering how much fake reviewing goes on there I wouldn’t normally lend any credence to (companies buy reviews,) but read them – they’re real. Anyway, grab one if you could use it. It’s a powerful dual port charger and a very useful tool to locate your car. The fully automatic app (available for iOS and Android,) makes it so you don’t have to do anything but have your cell phone on you.